I really hope that by 3 weeks into the month of April, everyone already knows that it is Autism Awareness Month. If you have been following my other posts then you already know that my son is Autistic. He will be 6 in July and he was diagnosed at the age of 3. Until age 3, he never spoke at all. I kept hearing from everyone that we was just a late bloomer or "He just has nothing to say". He was my first child and at 19 I was still fairly young, so was was inclined to believe all those older people when they said such things-at first. I finally realized that he was not just quiet, shy, or even delayed in a traditional sense. So I looking into it. I saw that he fit almost every "symptom" listed for Autism. He twirled, flapped, walked on tip toes, covered his ears, lined up toys feared new people or things and more. Trying to find a way to get him checked was nearly impossible and we were passed around from place to place. Finally we got him evaluated by Child Find, and the diagnosis confirmed what I had feared. Once I knew that he was would need to be approached in a different way of learning, it was so much easier, and I came up with lots of ways to get him interested and help him learn. He loved using magnet letters to put the alphabet in order. Even though he could not say them, he could still find them and put them in order very quickly. He would even choose either all caps or all lower case. He loved to watch the educational DVDs that would show the picture, say the word and spell the word. He would start copying them and spelling the words with his wooden blocks. I remember being amazing when I saw that he had spelled out Shakespeare. That turned into astonishment when I heard his spell it aloud(spelling bee style) while spinning around in a circle(effortlessly like it was second nature). He was maybe 4. I could probably not even do that. Now, he will be 6 in July and he still amazes me daily. Although I may be biased, I think he is one of the smarted kids his age that I have ever met. He knows all his colors(even obscure ones like Chartreuse and Vermillion) Shapes(nonagon, pen-decagon etc), can count to 100 and beyond, Can say, read, spell write or type almost any word. He knows basic math. His conversation and social skills are the only real area that you can tell his is challenged, but he is doing much better there as well. He loves to repeat things he has hear, especially from TV or computer games, but he is also using full sentences most of the time how where he used to only use one or two word commands. So instead of saying, "Drink" he says. "Another Drink Please". Instead of just "home" he says, "Now it's time to go home". I could go on about my little man all day, but I will get to the point. I am so so proud of my precious boy. He may have Autism, but Autism certainly does not have him. He is not "afflicted" with anything. He is a very smart, sweet, caring boy, and I would not change a thing about him. The way I like to put it, he is AWEtistic. I always want my son to know that autism is not a defect and that he is perfect. That he should be proud to be who he is and embrace what makes him different. I am always looking for ways to show my support and try to have everything from T-Shirts and shoes to teddy bears to display my pride and support for everything that my son is. The trouble though, is that I still want something more. One cannot reasonably wear the same shirt all the time, and when I wear jeans, the design on the shoes is covered and I am not going to have a bear attached to my hip so I can show it off. I needed something that I could wear every day, that looked great and would attract attention to get people to take an interest and learn about Autism Awareness. I thought maybe a button or something, and that would have been cool, but I found something so much better. It is more beautiful, more special, and even more supportive. 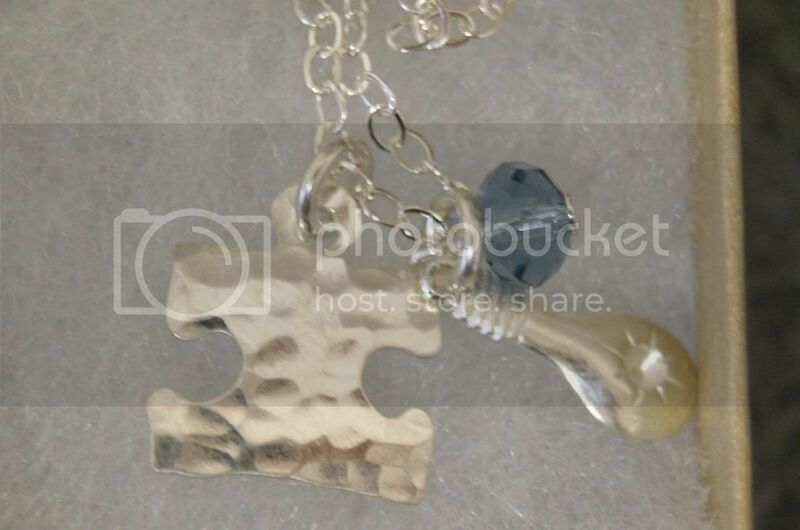 Jennifer Engel(creator of AMAZING wedding jewelry and also the beautiful Hayden's Heart Collection) recently created an Autism Speaks Collection and it is STUNNING! She actually created the line after being approached by a local mom in Williamsport. I think it is amazing that she would do that simple because of one request. That is true caring and passion for jewelry with a heart. The full collection features 11 designs that are available in different sizes and metals(Stealing, two-tone, gold filled). The are "sub-collections" as well though with coordinating pieces. I fell in love with the Light It Up Blue Collection. This is some of the most gorgeous jewelry I have ever seen. 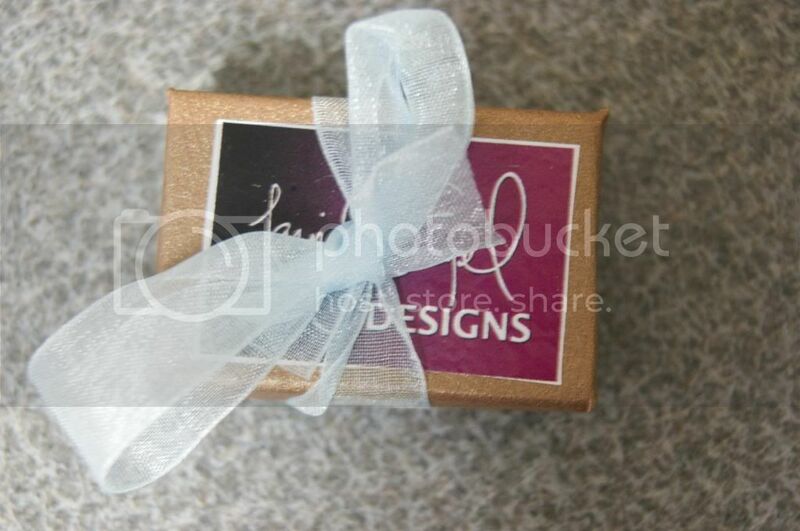 It even arrives so beautifully boxed and suitable for gifting. Look at the beautiful card that is included. 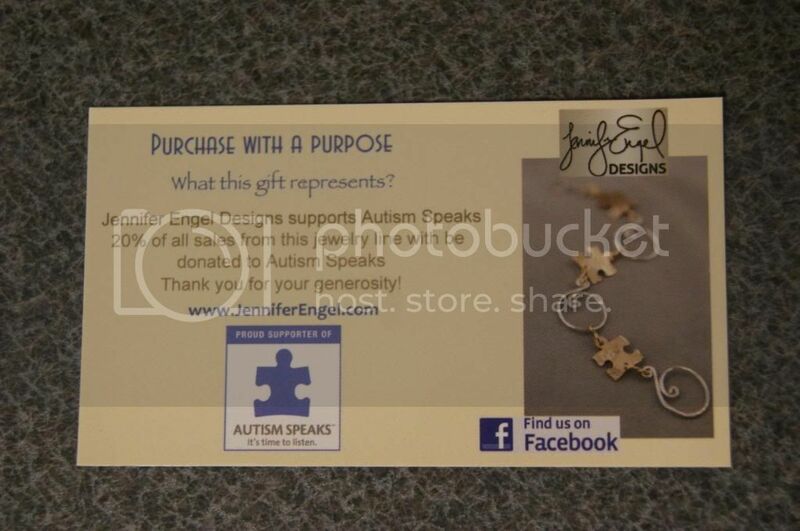 How generous is it for Jennifer to donate 20% of the PURCHASE to Autism Speaks? I am so touched by this. Most companies that donate a percentage only take from the proceeds, but 20% from the entire purchase is so incredible and kind. Such a giving spirit is very rare these days. The sentiment of the giving and the cause that these items are in celebration of is wonderful enough, but the quality and splendor of the prices themselves are equally fabulous. The Light It Up Blue Collection consists of 3 amazing pieces. The earrings are so adorable. So simple, tasteful, elegant. I love the small size. I don't want a hub cap hanging from my ear. I like small and dainty. Aside from one air of studs, this is the only pair of earrings I own. I really love these though, and not only do they look pretty, they are also lightweight and not too tight or irritating. They feel great in my ears and I would wear them all the time with no discomfort at all, which is very important to me. 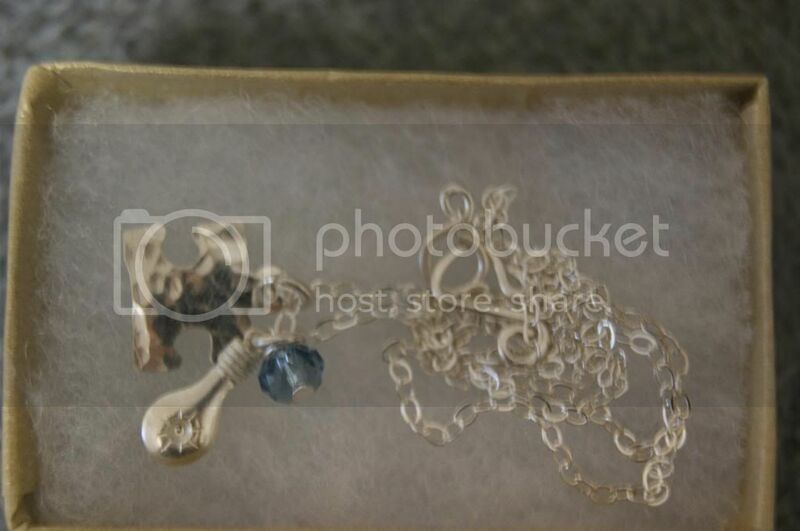 This necklace is so magnificent. 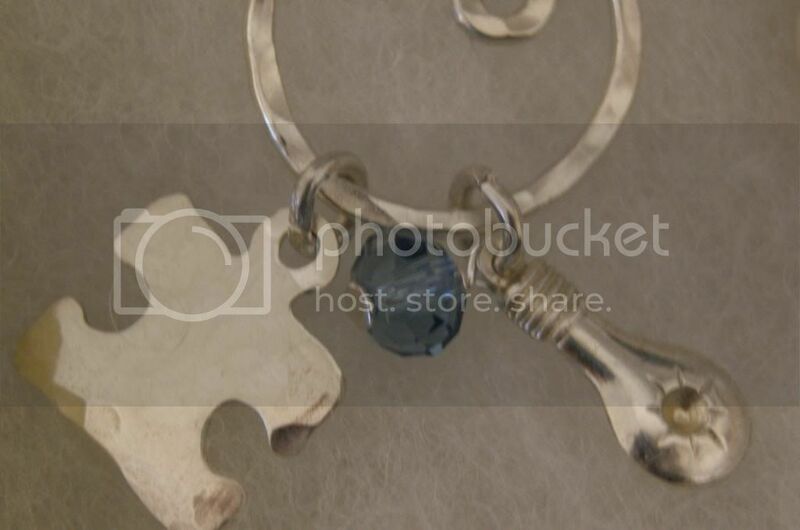 I adore that the Hammered Puzzle Piece matches the earrings perfectly, but the Light Bub and the little Blue Crystal give just that little something extra so this really stands out more. The chain is very dainty and does not distract from the lovely charms on the necklace, but it is also not too small, fragile or understated. It is the perfect compliment. This picture does not come close to doing justice for these 2 glorious pieces of art, but look how cute they look together. I love it. This is my favorite piece in the Light It Up Blue Collection(as well as he entire collection). 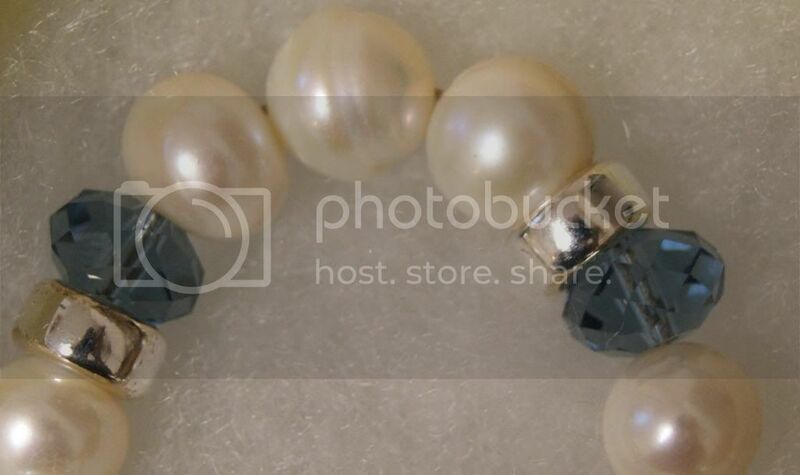 I have always loved the timeless, elegant, classy look of pearls, but I love that this has the extra beauty and individuality of the silver accent beads and the gorgeous blue crystals. The spiral closure is not only stylish, it is very functional. It makes it so easy to put on with one hand and keeps a good hold so it does not fall off. Plus the charms make it even more special. They match the necklace perfectly. This is the most beautiful bracelet I have ever seen, and when you put it with the other two pieces, it is truly breathtaking. I wish that my photos could show you just how dazzling these items really are, but they are so much more stunning in person. I have not taken these off since I got them. I have already gotten at least 6 compliments on those jewelry. The awesome thing about that is whenever someone mentions it who does not actually know that it stands for Autism Awareness, then I get to explain it, which is really helpful in increasing awareness. I know that a few people here and there will not change the world, but I love that I am able to help even in a tiny way. And if I get to look fabulous in gorgeous Sterling Jewelry while doing so, then that is even better. I am so thankful to Jennifer Engel for creating such a magnificent collection. Everything she makes is spectacular. 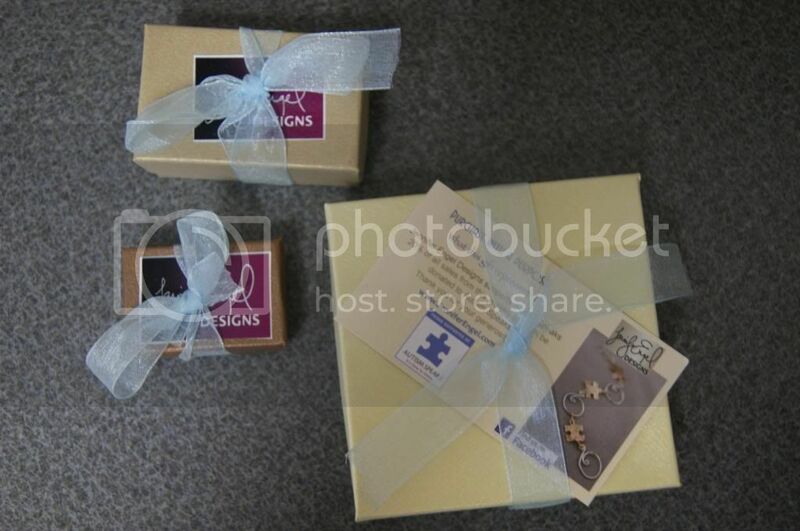 I love her generosity in donating 20% of sales from this collection to Autism Speaks(the money is sued to pay for Ipads and Field Trips for special children). Jennifer is an inspiration to me in every way, and I think that everyone should own at least one of her glamorous and heartfelt pieces. 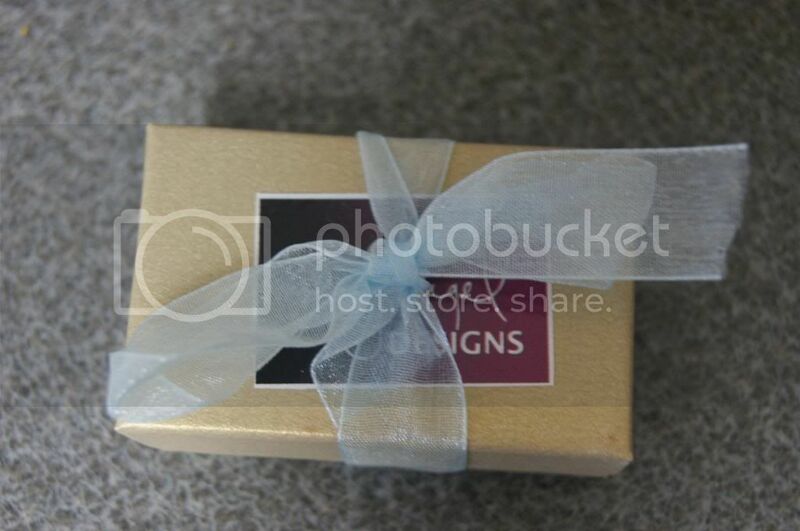 And they would make a gift that is sure to be cherished forever. so you are always up to date on all the beauty she creates. 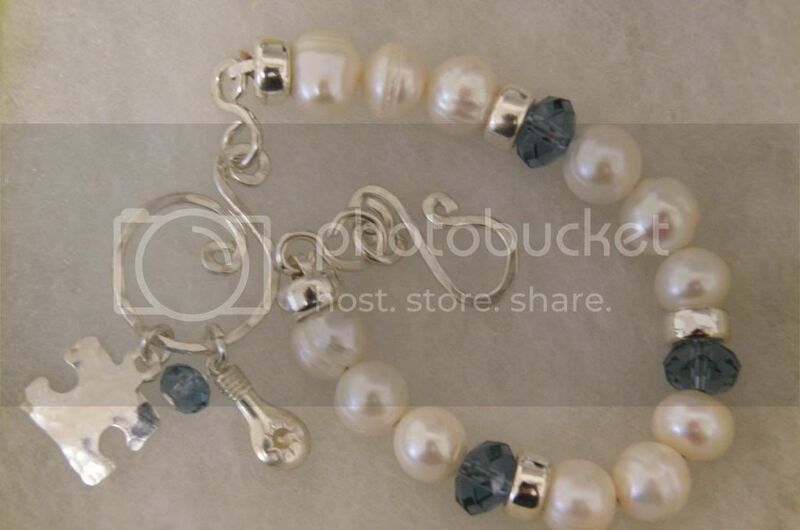 Love the jewerly! So pretty and so unique! Wow, so beautiful and what a great cause! 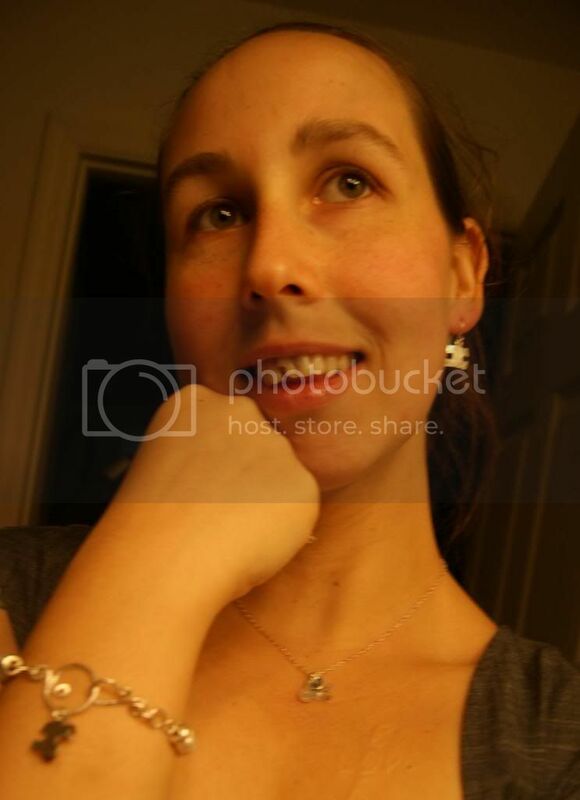 I love that jewelry and you look beautiful wearing it! 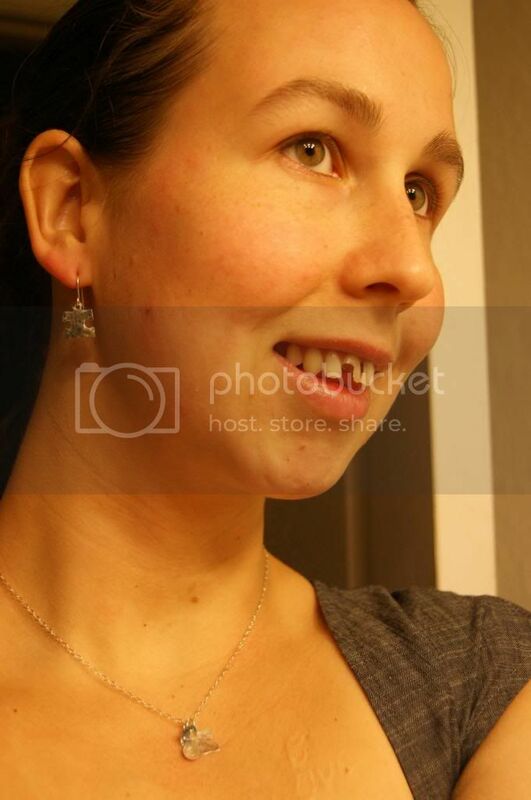 Oh wow Andrea, those are gorgeous jewelries! They look wonderful on you! I love the bracelet and earrings! They are so cute and such a good cause! 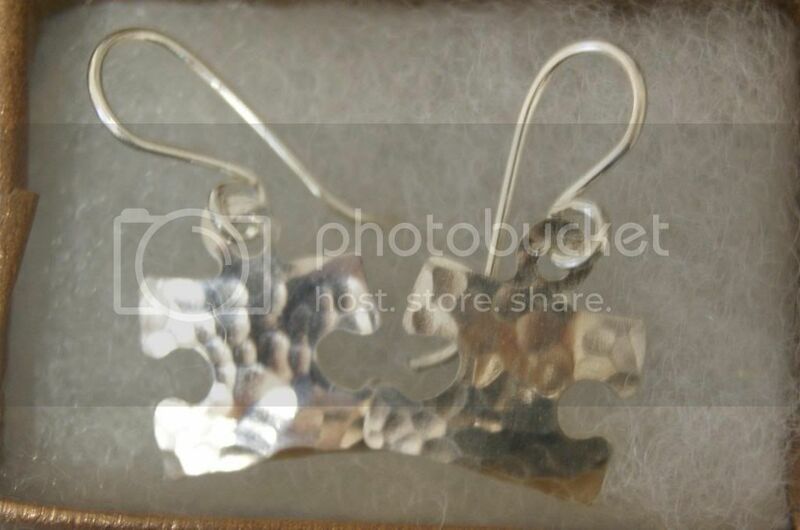 Those are absolutely stunning pieces. Wow, beautiful jewelry and a great initiative!! Those are absolutely beautiful. 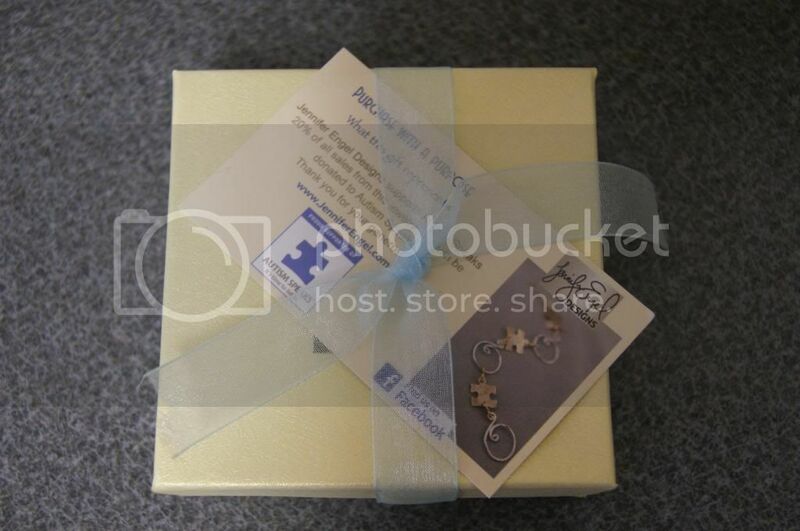 Love things that support awareness for Autism. I love all the collection, so beautiful! Beautiful set of jewelry. Nice to know that there are companies that supports Autism. Can you tell me more about your collections and i am looking forward to best Wholesale Scarves stores in USA?